Early this month, Nike hired free agent pro football player Colin Kaepernik for its new ad campaign, which celebrates the 30th anniversary of the iconic "Just Do It" ad campaign. Kaepernik had already been a spokesperson for the company since he was first drafted in 2011. However, his contract was about to run out, so Nike hired him for this new campaign. 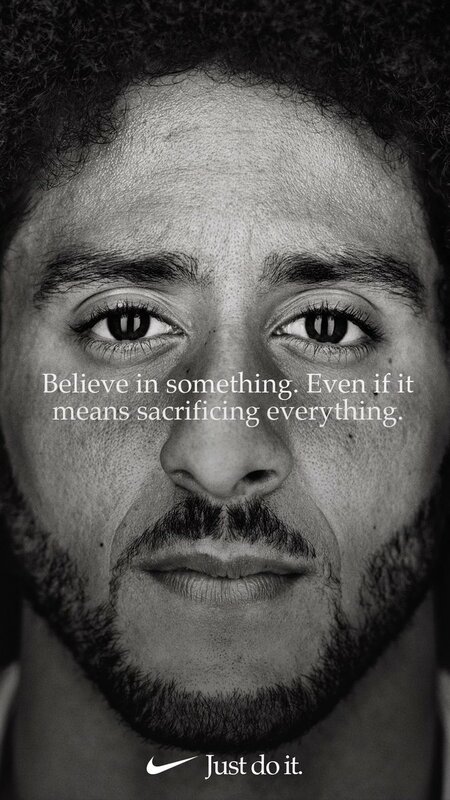 Kaepernik sent the internet into an uproar September 3 when he posted the new ad on his Twitter feed, featuring his face and the words: "Believe in something, even if it means sacrificing everything." and the hashtag "JustDoIt." 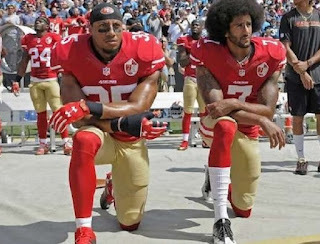 As you may recall, Kaepernik is known as a controversial figure, due to his kneeling in 2016 during the national anthem at a 49ers pro football game to protest racial injustices against African-Americans. Many other NFL players started doing the same thing, as well as other celebrities and ordinary people (to show support). 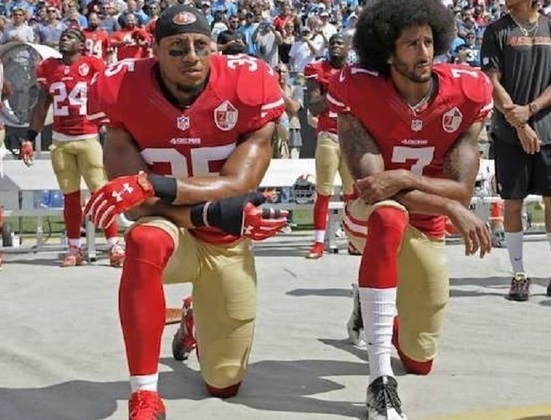 Kaepernik had originally been sitting during the anthem, but he started kneeling because he was told by former NFL player and U.S. military vet Nate Boyer that kneeling would be more respectful. Despite this, many conservative people became outraged over the kneeling, feeling that it was disrespectful to the flag and to the military. This also started a Twitter battle between President Trump and the NFL. 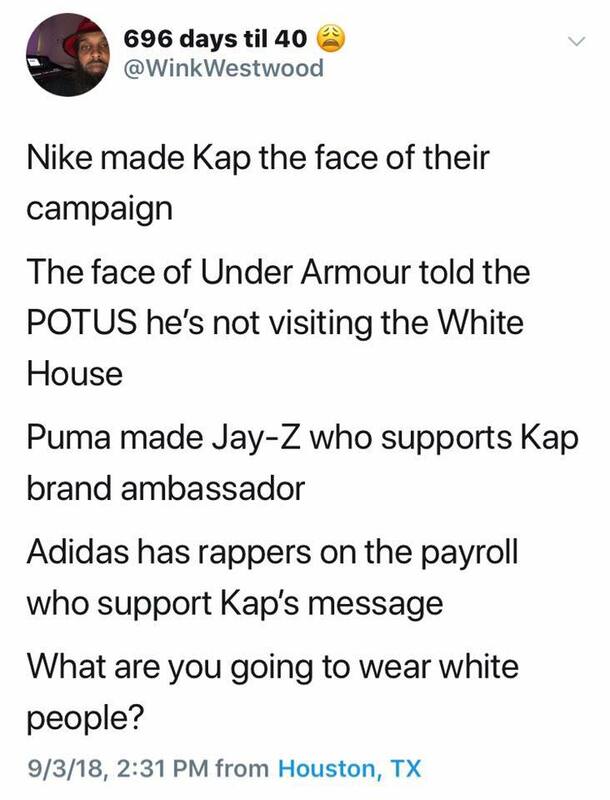 After Kaepernik released the Nike ad, a huge twitter storm erupted. 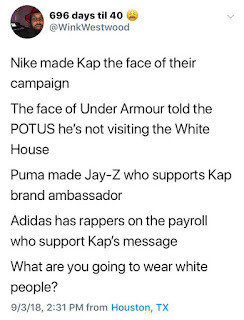 Tweeters on the right cried foul and started the hashtag #boycottnike. 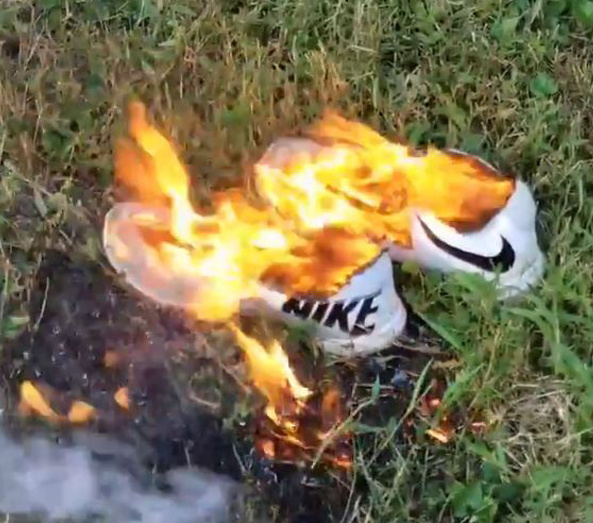 Some posted photos of burning Nike shoes and cutting off the Nike "swoosh" from their socks. Tweeters on the left supported Nike and Kaepernik, ridiculing the people destroying their Nike gear. 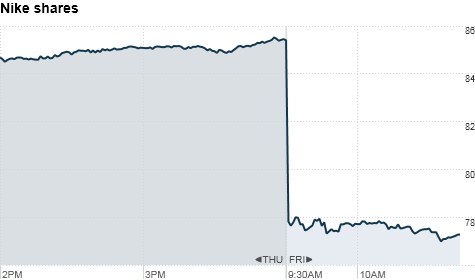 Meanwhile, on the stock market, Nike stock dropped 3.2%, costing them $4 billion. 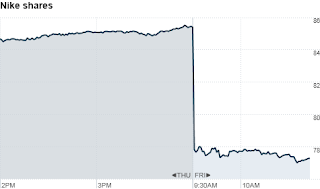 However, Nike stock has been steadily increasing since the beginning of the year, so this drop was a temporary fall. Many people are now buying more Nike products, which will probably get Nike more money and support in the long run. Nike has a long history of addressing social issues, so this is just the latest ad campaign to drop criticism. Today, Nike showed that it's not backing down to criticism by releasing a full-length ad for their new campaign. 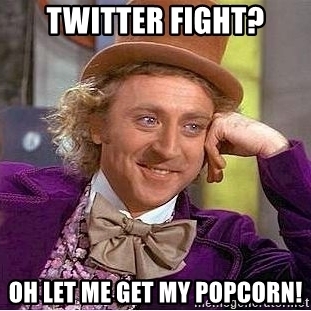 Most of Twitter has moved on to a new controversy.